Need a fun, inexpensive playdate to do this summer? 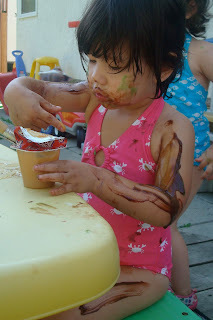 Have a Paint Your Body With Pudding Playdate!! We had our first ever pudding party playdate with some momstown mama's in Winnipeg a few weeks back. The kids had a blast and you could definitely tell which parents were the clean bees of the group! There was a lot of laughing going on and lots of licking! It's super easy. All you need is pudding, food colouring (or you can use kool-aid), paint brushes, and a whole lot of water! 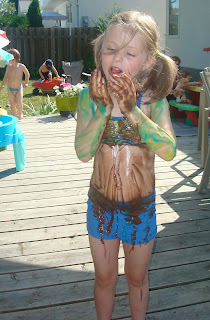 Kids got to paint their bodies with pudding. I took several flavours and used food colouring to make different colours of 'paint'. Vanilla works the best when making different colours with the food colouring. Set up everything outside (as it will get messy). I found it was easy for the kids to sit at the picnic table where I set up some bowls of paint. Each kid also got their own individual bucket of paint (aka: Snack Packs!) to eat... I mean 'paint' their bodies. Okay, let's face it, they were pretty well eating out of it!!! 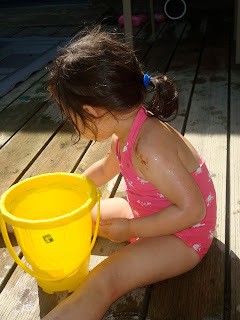 I set up the kiddie pool and the water table for the kids to clean up in. The pool looked pretty gross by the end of the party! It's a great event for kids of all ages. It's safe enough for babies and the older kids got really into it! Most importantly, make sure you invite kids who enjoy cleaning! We had a few helpers that helped me clean off the tables and the deck afterward. There was pudding everywhere!!!! Thanks to momstown Burlington for giving me this idea. My daughter attended her first pudding party last summer while we were living out in Burlington. 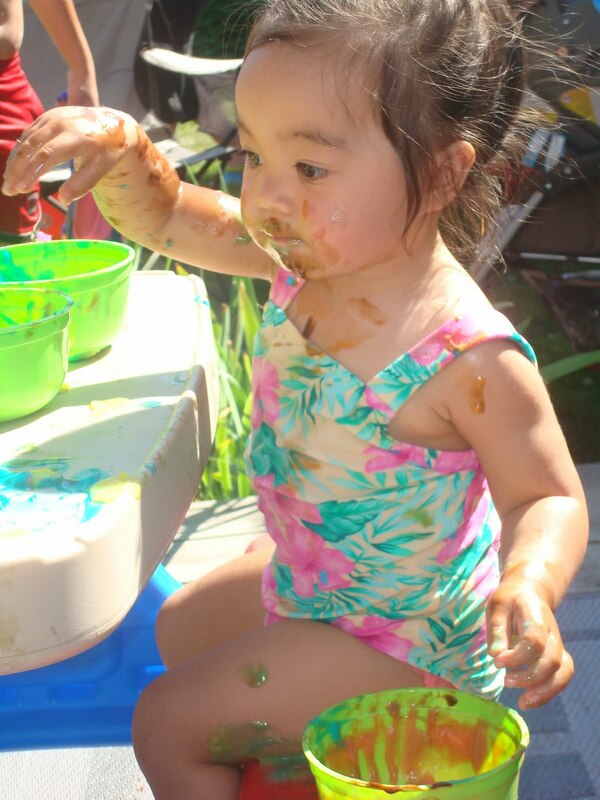 Pudding party playdates are a momstown standard, so you'll for sure see this event again next year! It's a fun, inexpensive playdate that anyone can host this summer. But I highly recommend you take this playdate outside!